Lacquer Lockdown: Hot Off The Stamping Press: UberChic Beauty Collection 9 & New UberChic Mini Nail Art Stamping Plates! 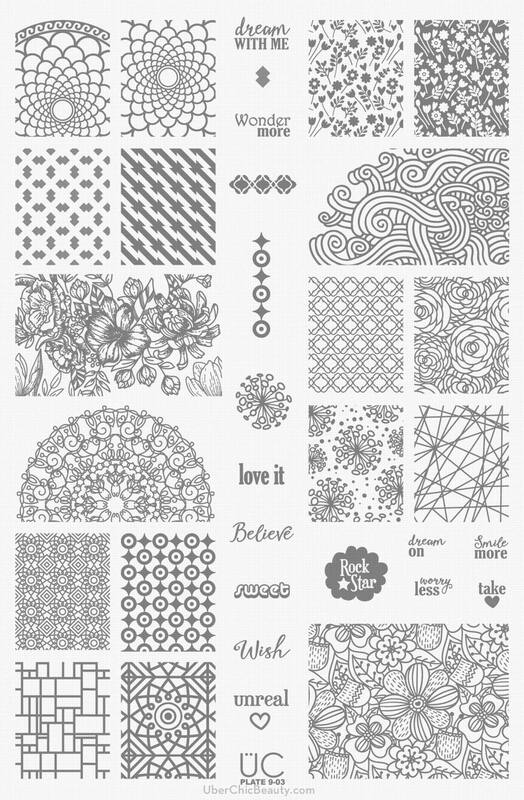 Hot Off The Stamping Press: UberChic Beauty Collection 9 & New UberChic Mini Nail Art Stamping Plates! Miss me? I missed you oodles and oodles. My life has been so chaotic lately the kind of chaos that just seems to be never ending. I've hardly been able to touch my nails which feels so weird. They've been naked for a while of which is definitely not normal for me. Let's amend that tomorrow, but for now let me share a new release with you from the powerhouse indie brand UberChic Beauty as Brittany gears up for yet another fantastic release! And here come's Collection 9 it's hard to believe UC is really only a little over a year old when I type things like that. Fresh fruit slices, teeney tiny flamingos, psalm trees and more flowers than you can shake a stick at. The little ice cream cones that make me smile uncontrollably and my favorite? The baby pineapples. I love a good tropical themed plate. Brittany did a great job of avoiding recreating some of the themes we've seen before so that we are left with a touch of novelty. 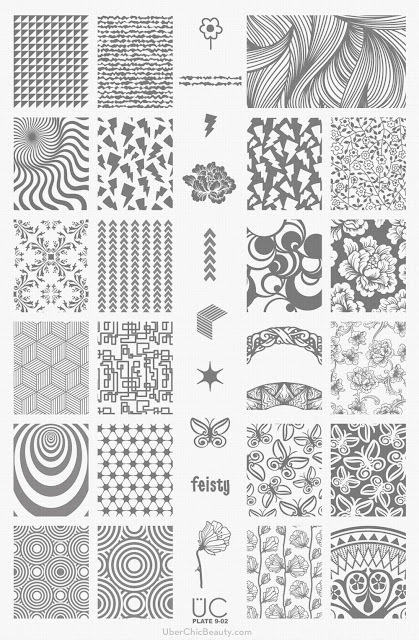 The customary lust inspiring UberChic florals are combined here with some abstracts that fall into those magic eye categories that have been so popular of late as well as the more classic geometrics and then just some images I've really never seen before - bottom row first from the right, 3rd row 2nd from the right, 2nd row 1st from the left. Hmm there's enough going on with this plate for me to put it in the intrigued/wishlistable category. I could see someone who doesn't have as broad a collection as mine snatching this one up quickly. This plate is just pretty. It was the first then I thought when I saw it. All the soft abstracts and linear swirls. Lord knows I'm partial to swirls I have a lot of tutorials up featuring swirls lol. There are a few more classic geometrics. And of course a few of the delicious UberChic florals. Its a solid collection is Set 9. Despite my best efforts (my wallet hates me) I find myself gravitating toward the UC plates again. She always manages to put images that make me say...well now I need that I don't have x in my collection yet. Rofl. Here's another good example of how she does this. I own an embarrassing number of feather plates. I mean I just keep freaking buying them even when they have dupes to images I already own. 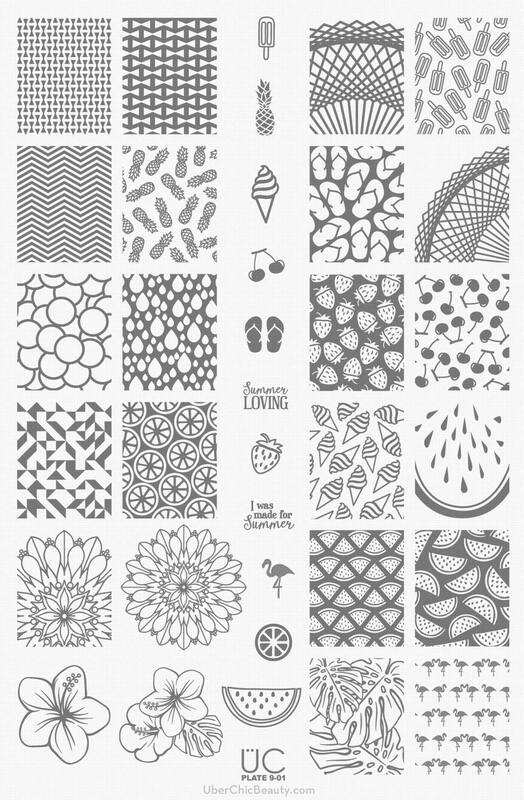 Btw this one does as well the floating down feathers in the 2nd row second from the left and 3rd from the left. I have them across at least 2 other brands. At least 2! So wtf do I want this plate??! Um hello! I do not own a single feather plate with feathers dancing in circles or with the slightly tribal feel of the those from the top row 3rd from the left or the delicious ones top row first from the right or...ok. I'll stop. A lot of these images are completely new images of feathers. How'd Brittany do that? Also how do I get this plate to me without any delay? I know greedy....lol. PS this is my favorite plate of the entire release! Love it!!! So these plates released from UberChic Beauty today. The collection retails for $24.99 and the smaller UC Mini's for $7.99 USD. As usual everything is fabulous! If you haven't gotten it already I'd definitely recommend picking up the Clear Jumbo Stamper from UC. That thing has become my love buddy in the extreme. Everything about it is fly and streamlined for ease of use. Let me know what your favorites are in the comments below and I'll see you next post. Happy hunting!